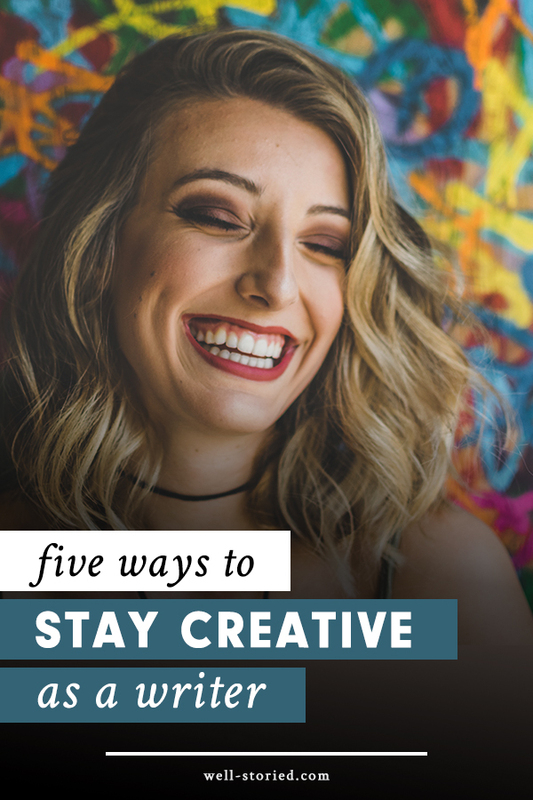 5 Ways Writers Can Stay Creative (beyond simply writing + reading!) — Well-Storied. As writers, writing and reading are the two best ways to fuel our creativity. What fuels an artists' work will be different for each of us, but in this week's #FridayFive, I'm sharing five ways that I encourage creativity in my own life outside of simply writing and reading in the hopes that these steps may prove helpful to you as well. Ready to dive in? #1: Make time for hobbies. Writing likely started as (and still is) a hobby for most of us, but making the time to enjoy other unrelated hobbies can be a great way to give yourself a break and to stimulate your mind in a new way. My own non-bookish hobbies include playing guitar, growing plants, hiking, thrift shopping, playing records, and listening to podcasts. Again, staying creative is all about keeping your mind stimulated. Actively learning new things is a great way to do this! You can make space for learning things that don't in any way influence your writing (for me, this is learning Spanish), as well as studying subjects that inform your stories (which, for me, is anything to do with history, sociology, and anthropology; I love 'em all!). #3: Surround yourself with inspiration. This one's pretty straight-forward. If you can build or frequently make time to put yourself an in an environment that inspires you, you'll have no trouble boosting your creativity. What that environment looks like, however, will be different for all of us. For me, this means listening to my favorite albums, arranging and decorating my bookshelf, enjoying nature, listening to family members tell stories, or heading out to a bookstore or coffee shop and people-watching. #4: Get out of your head. If you're a Type A person like me, your brain is constantly reeling with all sorts of thoughts, both positive and negative. It's no wonder my mind often feels too cluttered to focus on writing. That's why making an effort to get out of my own head is so important. For me, this looks like writing things down or talking them out. I tend to write down anything I'm thinking over about my stories (such as plot holes or new story ideas), while I prefer to speak to someone I trust about any other worries or concerns. Doing all of this really helps free up the mental energy I need to put good words down on paper, so if you're struggling to stay creative with a busy mind, try letting those thoughts run free as soon as possible. #5: Take time to relax. Again, if you're anything like me, you have to constantly remind yourself that you don't need to feel guilty if you aren't 100% productive all the time. Resting up so both your body and mind are in tip-top shape is oh so important to creativity. My preferred ways to relax include listening to podcasts, watching Youtube, browsing social media, going to the bookstore, and lighting candles to enjoy while listening to my favorite records. How will you take time to fuel your creativity?